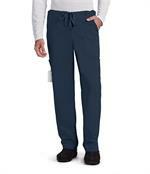 This Grey's Anatomy Men's pant features 6 pockets and zip fly drawstring waist with twill tape detail. Inseam is 32". Made of 77% polyester / 23% rayon.